You are here: Home / Gozo & Comino / Comino as you’ve never seen it before! Comino as you’ve never seen it before! Comino, an isle known to Leslie Vella all his life but a place he’s never stayed on overnight – until recently. Here, he takes a walk on its wilder side at dusk and sunrise to capture a rare and precious insight into this still lonely isle that’s known mostly for its day-tripping crowds in peak summer. This is insider’s Comino. We can’t do justice to all Leslie’s photos, so do see his Comino portfolio here. 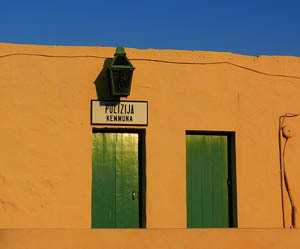 Since my childhood, Kemmuna or Comino has always held a special fascination to me. Snugly nestled between its larger siblings Malta and Gozo while, in turn, taking care of its own brood of tiny islets including the appropriately named Kemmunett or Cominotto, this small one square mile of Maltese territory possesses a uniqueness which makes it special. Comino is near, but also far away. Contrary to what one would expect for one of the smallest islands in an archipelago, Comino is not in some far flung corner like Filfla, but just off the geographical centre of the Maltese Islands. In the days before ferries became widely available, for people like me Comino was a terra incognita, an island one got tantalisingly close to when crossing the Malta-Gozo channel, but never to step on. From the Gozo ferry one could glimpse the almost bare rock of the island, the few stunted trees, the imposing Santa Marija Tower and a handful of other man-made structures. One could also see the imposing cliffs, punctured by the occasional cave or grotto, and, between the thimbleful of rocky outcrops that separate Comino from Cominotto, a glimpse of that most unbelievably turquoise of shimmering water, the exotic and almost out-of-place Blue Lagoon, bearing the twentieth century and touristy name of a body of water otherwise matter-of-factly and aptly named “Bejn il-Kmiemen”, literally “Between the Cominos” by our practical, down-to-earth ancestors. My first forays to Comino actually consisted of the ubiquitous day trip to the Blue Lagoon. A visit to this enchanted spot is truly an experience not to be missed, irrespective of the fact that it is currently being abused beyond the limits of sustainability by a myriad of boat operators who dump boatload upon boatload of day trippers onto the spot with its minute jetty and its postage stamp sized stretch of beach. In spite of the crowds and the lack of space, however, swimming in the crystal-clear, transparent waters of this spot is a unique experience which one does not expect to find so far from the South Pacific. Comino is not only about the Blue Lagoon though. Beyond this gem there is so much more. What is there on Comino? Although its odd square mile is mostly garigue, it also features an amazing number of features, man-made or otherwise that increase its attraction and fascination. It is one of those amazing places possessing one of a number of many things: one medieval chapel, one police station, one coastal watchtower, one permanent household, one hotel and one coastal defence battery. It also contains one cemetery, one water pumping station, one abandoned pig farm, one lighthouse and one helipad. Quite a list for a small rock. I will not delve into the history of this small but fascinating island, as it has already been adequately covered in the excellent article penned by my old friend Evarist Bartolo, but will dedicate the rest of this short write-up to my own experiences and views. 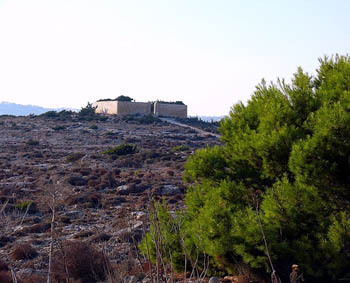 To develop or not develop Comino? “Comino is crying out for development!” Thus uttered a work colleague who was my superior a quarter of a century ago. My angry response to this statement was the equally emphatic, “Comino is crying out to be left alone!” I still stick to this opinion after all these years. Comino does not need development. Comino does not need any further interventions. Comino needs a simple and practical management plan. Nature will do the rest. This summer I spent my first ever overnight stay on Comino, staying in the charming, although showing the signs of wear and tear, four-star Comino Hotel. All my previous visits had concentrated on the Blue Lagoon apart from one particular day trip sometime in the early 1990s when I had spent a day with Birdlife Malta volunteers who were ringing birds during the spring migration. 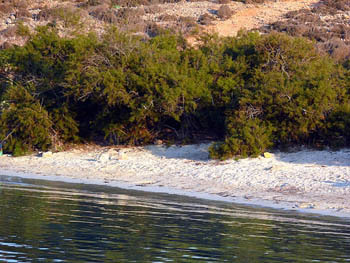 Extending one’s stay by an overnight on an island like Comino makes a huge difference. Having a hotel room base means that one can extend his range, both in terms of time and in terms of distance, beyond the limitations imposed by a typical day-trip to the Blue Lagoon. 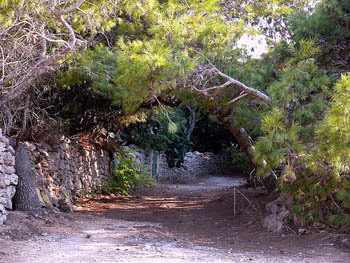 For although distances on Comino are invariably small, the summer heat, lack of shade and the rough dusty paths that constitute the island’s roads all contribute to making summer trekking a bit of a feat, ideally to be undertaken either in the early mornings or in the late afternoons and evenings. The period between 09:00 and 17:30 is best left to swimming, sunbathing or relaxing in the shade of the hotel’s terraces! Over the course of one short evening and an even shorter morning, I managed to explore around one half of the island. In the evening I walked uphill from San Niklaw to the Santa Maria Tower on the high ground spanning the Malta-Gozo channel. En route I took the short detour to the small enclosure housing the closed and abandoned Comino Cemetery. The walled enclosure which is sealed by a padlocked gate contains a small cross monument in its centre, a set of unmarked graves on the left (some with their top slabs broken, presumably vandalized) and disturbed ground on the right. The walls protect a group of gnarled and windswept cypress trees clinging for dear life on this harshly exposed hill. Continuing uphill, one eventually starts walking on a pleasant dirt road which is lined by low pine and sumac trees on one side with excellent views of Gozo, Cominotto and the Blue Lagoon on the other side. This road leads to the remains of the one hundred plus year old British Isolation Hospital built after a cholera epidemic and the splendid glory of the Santa Maria Tower. The Hospital building and some adjoining structures are apparently used by the only permanent residents on the island as evidenced by the various positive and negative signs of human habitation ranging from some small carefully tended fields, clothes hanging out to dry, the odd free-range chicken, and also the amazing collection of abandoned vehicles, boats and other mechanical paraphernalia which look like a mini scrap yard. The Tower, lovingly restored by Din L-Art Helwa is a joy to behold and climbing its steep staircase raises one to an altitude which gives an immense perspective overlooking the four main Maltese islands. The same cannot unfortunately be said about the Hospital building which bears the signs of years of neglect and abandonment. White washed as if it were in Greece. On the way back I decided to go downhill all the way to Santa Marija Bay. 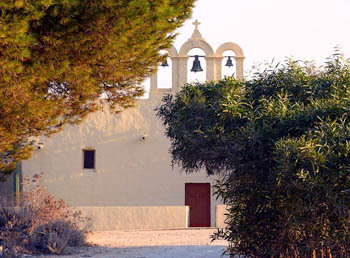 The entire road follows the natural course of Comino’s main valley which means that one side of the entire route is very well planted with a variety of trees and shrubs. The lower part of the valley also contains a small batch of cultivated fields before opening up to the small beach and its tiny sand-dune habitat. Two thirds of the way down one encounters the small and charming chapel, apparently of medieval origin, with its rough façade and three arched belfry: a very well maintained, impeccably whitewashed structure surrounded by a protective band of trees which is more reminiscent of what one expects on a Greek island rather than in Malta. My morning tour started at an early hour: at 05:40 I started walking east along the lit coastal path towards the Club Nautico. Reaching the top of the low slope at 06:00 I had a clear, unobstructed view of a glorious sunrise: an experience which is unique every time you witness it. After ten minutes or so of savouring the beauty and the solitude, it was time to take the twenty minute trek to the Blue Lagoon, walking along a path which is parallel to the Gozo coast a few hundred metres across the water. At this hour the Blue Lagoon was still devoid of people with the exception of a gang of cleaners who were busily and efficiently removing the copious remains left behind by the previous day’s visitors: remains comprising a boatful of plastic bottles, cans and ice cream packaging. Some estimates suggest that up to 4,000 people a day visit the Blue Lagoon during the peak summer months. Perhaps the time has come to consider establishing a capping for the number of such visitors, as the place definitely cannot sustain such a daily influx while continuing to ensure safety and a positive visitor experience. I shall definitely be back. Perhaps in October before the hotel shuts down for the winter, or in May/June before the crowds start to peak and when the landscape is still full of life and wild flowers. There is still more than one half of the island to explore. I would like to revisit the Tower, hopefully when it’s open for visitors, hear Mass in the tiny Chapel and take a peek inside the Police Station. I would like to revisit the Blue Lagoon at midday in autumn when almost no-one else is there and be able to hike across the island without having to avoid the unbearable sun. Photos: all courtesy of Leslie Vella. See his Comino portfolio here.